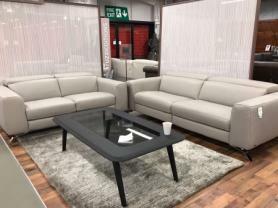 Natuzzi Editions power reclining 3 seater and 2 seater sofas. Upholstered in beautiful grey craftsman Italian leather. Features 4 whisper quite electric recliners and electric headrests operated by concealed heat sensitive buttons. A fabulous new arrival at Furnimax of which we have a limited amount in stock for rapid delivery. Ultra stylish with Italian chic and flair make this suite an enhancement to any room. The 3 seater measures 220cm wide x 106cm deep, the 2 seater measures 186cm wide x 106cm deep. Click the PDF icon below to download the datasheet for the Natuzzi Editions Michelle.